With concerted effort being put in making natural resource management an all inclusive participatory bottom up process with a deliberate action to involve local communities, minimal focus has been given to the two prime social aspects of most local communities especially in Africa; culture and religion. This study looked at fisheries co management and specifically focused on the role cultural repertoires and religion may have in influencing local community participation in fisheries co management. A case study of Kuruwitu beach village in the North Coast of Kenya was selected. It sought to establish if the cultural repertoires‟ and religious beliefs of the Giriama community informed fisheries management and further on investigate if they still influenced modern-day fisheries management under the fisheries co management approach recently adopted by the Ministry of Fisheries Development. Ultimately, the study sought to find out if it would be imperative to incorporate such social aspects in the management framework. Primary and secondary data findings give an indication that the Giriama community still largely values their cultural and religious practices that revolve around fisheries management and this has however not been integrated in the co management regime implemented through the Beach Management Units (BMUs).Further analysis suggests that may be it would be prudent for policy makers and development interveners to incorporate these positive aspects while planning with such communities as this makes them own the process hence a more fruitful venture. Relevance to Development Studies At the core of development is sustainable natural resource management which recognizes the inexorable role of decentralization of natural resource management to the local communities through co- management. 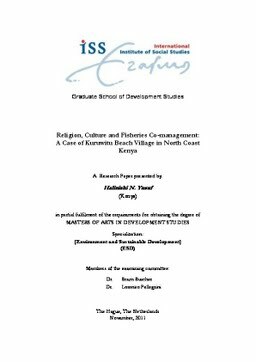 This study takes this further by seeking to establish the role social aspects; religion and culture may have on community‟s engagement in natural resource co- management with a special focus on fisheries resources in the North Coast of Kenya. Lessons leant here can be applied in other natural resource management cases for policy makers and development interveners.